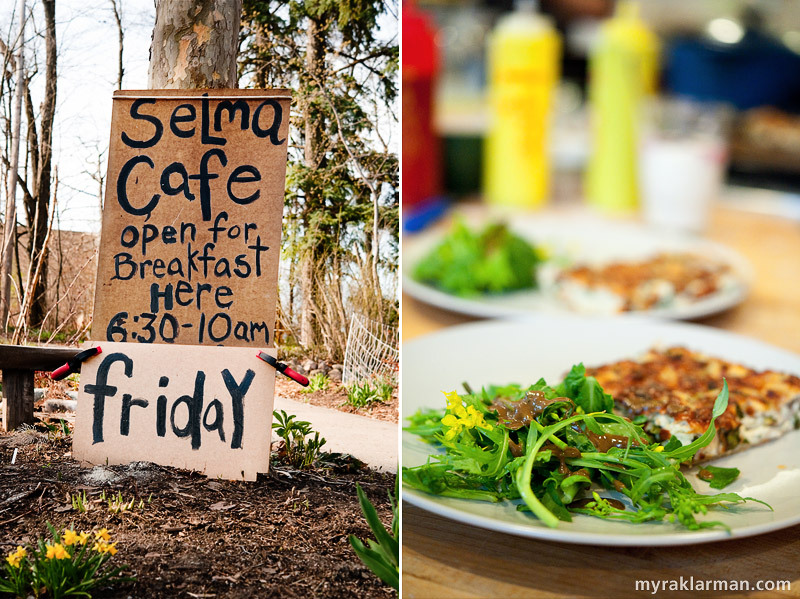 Spring has sprung at Selma Café. | Silvio’s breakfast special proved to be the perfect dish for Selma’s big day. 1 man — as in “the Man” — dropped by to personally serve notice upon Jeff and Lisa regarding their out-of-compliance chickens. Apparently, they have one more chicken than the law will allow, and they keep them in a location that’s not exactly cricket. See Jeff’s post on the Repast blog for more details about that. 12 members of the Ann Arbor Bicycle Choir chose Selma Café as the venue for their second-ever meeting — song ideas and a mission statement were on the agenda. More info. 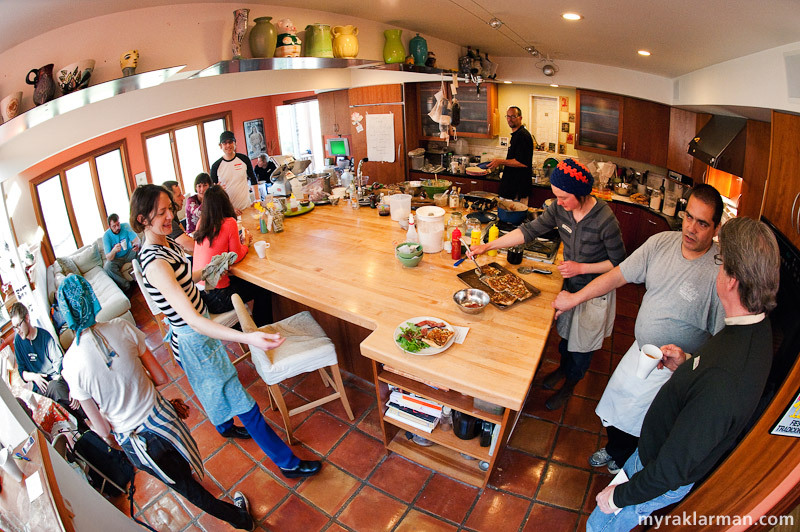 123 breakfasts — as in ONE-HUNDRED TWENTY-THREE breakfasts! — were served. This is nearly 50% more than the previous high count of 85. 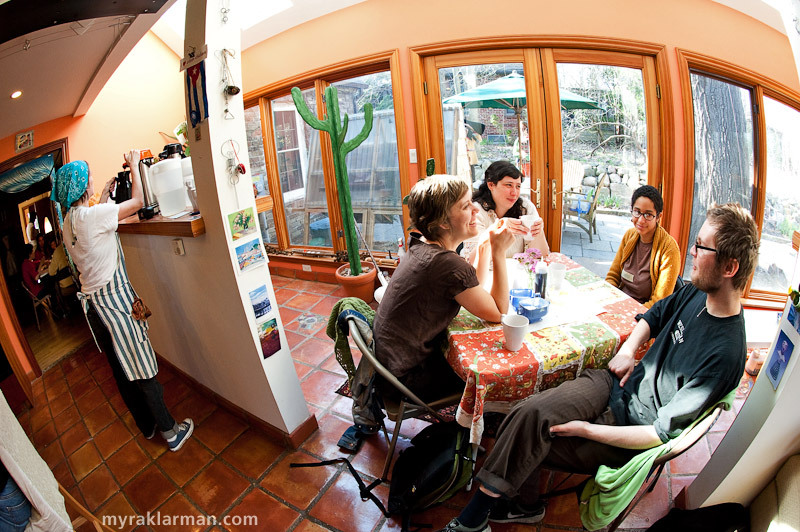 A fisheye view of the kitchen and main eating area — during a relatively quiet time at Selma Café. The rest of the main eating area — with a peek at the dining room (left) and the back patio. Volunteer Kate Daum worked overtime on the waffle iron, going through several batches of batter. 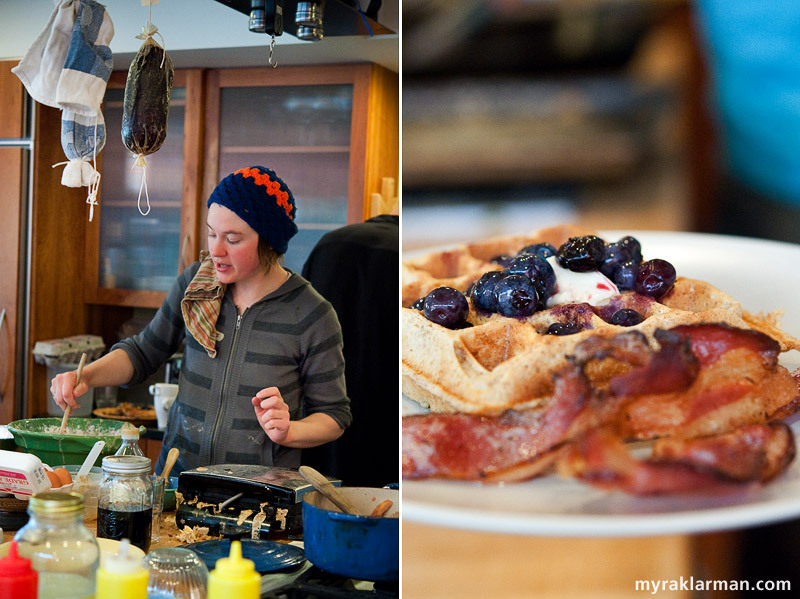 | The fruits of Kate’s labor, served with blueberries and bacon strips. 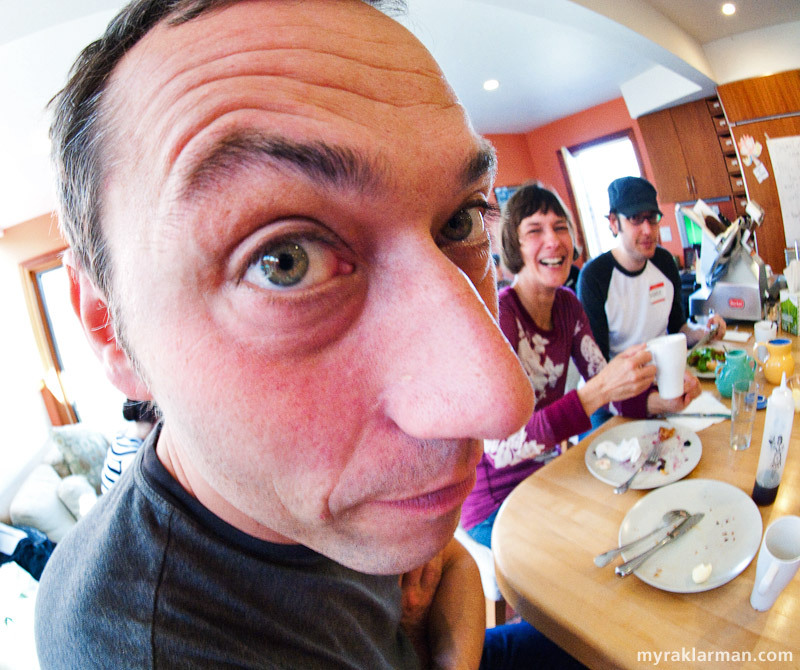 Jeff and Lisa’s neighbor Johannes finds out what happens to your face when you get close to my fisheye lens. You’ve been warned! The magic of Myra appears again before our very eyes! 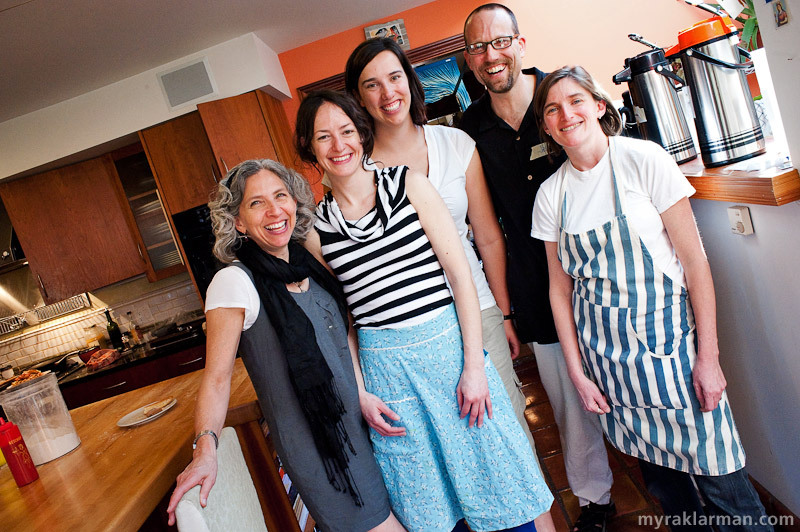 You wave the magician’s wand of your creativity and vision to make art out of the simple patterns of light, color, collaboration, food and intention. The fish eye lens captures the vibe, baby. Thank you magician extraordinaire. I (heart) your use of the fisheye lens. Lovely. And, we need to get with the chicken plan. Seriously. You folks may call it magical. I call it dangerous. Watch out for that fish eye lens!! !